"About 35 miles northwest of Benkelman, Dundy County, on the 6th of June  a very startling phenomenon occurred. It seems that John W. Ellis and three of his herdsmen and a number of other cowboys were out engaged in a round-up. They were startled by a terrific whirring noise over their heads, and turning their eyes saw a blazing body falling like a shot to earth. It struck beyond them, being hidden from view by a bank." The article, from the Nebraska Nugget, goes on to say that the rancher found "fragments of cog-wheels, and other pieces of machinery" lying on the ground. The heat was so intense that "as to scorch the grass for a long distance around each fragment and make it impossible for one to approach..." The group found the main part of the wreck and one of them "fell senseless from the gazing at it at too close quarters. His face was blistered, and his hair singed to a crisp." "Finding it impossible to approach the mysterious visitor [the UFO] the party turned back on it's trail. When it [the UFO] first touched the earth the ground was sandy and bare of grass. The sand was fused to an unknown depth over a space about 20 feet wide by 30 feet long, and the melted stuff was still bubbling and hissing." Later in the story the ship is described as being 50 to 60 feet long, cylindrical and 10 to 12 feet in diameter. The writer notes that it was apparently composed of metal with an appearance like brass, but was remarkably light. The story also notes that the wreck is located in a remote and wild region and "the roads are hardly more than trails." "About 6 o'clock this morning the early risers of Aurora were astonished at the sudden appearance of the airship that had been sailing throughout the country. It was traveling due north, and much nearer the earth than before." The article describes how the air vehicle "sailed over the public square and when it reached the north part of town collided with the tower of Judge Proctor's windmill and went to pieces with a terrific explosion, scattering debris over several acres of ground, wrecking the windmill and water tank and destroying the judges's flower garden." It continues with, "The pilot of the ship is supposed to have been the only aboard, and while his remains are badly disfigured, enough of the original has been picked up to show he was not an inhabitant of this world." "Mr. T. J Weems, the U.S. Signal Service officer at this place and an authority on astronomy, gives it as his opinion that he [the pilot] was a native of Mars." According to the story the remains of the ship were composed of a strange metal that seemed a mixture of aluminum and silver. The townspeople came to view the wreak and pick up specimens. The pilot was buried the day after the article was published. So what can we make of these crash stories? Was 19th century Earth visited by extra-terrestrial beings with superior (but apparently faulty) technology? In viewing any article from 19th century newspapers we must be aware of the abundance of hoax journalism during that period. Newspapers didn't just report news, but also provided entertainment. Much of this was in the form of books that were serialized of a number of issues. Some of it was in another form that is little regarded now: The hoax news story. Both of the above are probably examples of this almost forgotten tradition. How do we know? Mainly because they lack any collaborating evidence. In both cases no follow up stories were ever written which seems strange if events of the magnitude suggested did really occur. Also no pieces of the spaceships have ever shown up in local museums or historical societies. The Texas incident was investigated in the late 1960's. Then residents of Aurora who were there in 1897 were still alive. None reported that they remembered the crash. Several stated that Judge Proctor never had a windmill. One confirmed that the T. J. Weems mentioned in the story was not a signal officer, but the town blacksmith. Most were of the opinion that F. E. Hayden, who had written the story, was just trying to get some publicity for the town. In addition, a search of the alleged crash site with a metal detector revealed nothing. The story might have remained dead except for a writer with the Dallas Times Herald. In 1973 the newspaper did a series of sensational stories about the "crash." Despite faulty evidence and questionable witness accounts the stories managed to attract national attention. The excitement reached its peak when an Aurora cemetery was desecrated. The cemetery had kept meticulous records showing just who was buried where and there was no "man from mars" on the roster. Despite this, a plot, that some claimed was the Martian's, was dug up and the tombstone stolen. 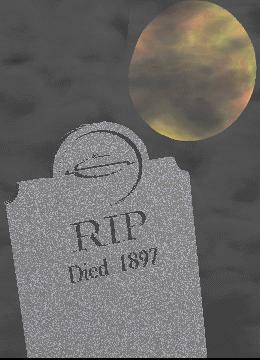 According to some accounts the tombstone had a picture of an UFO carved into it.